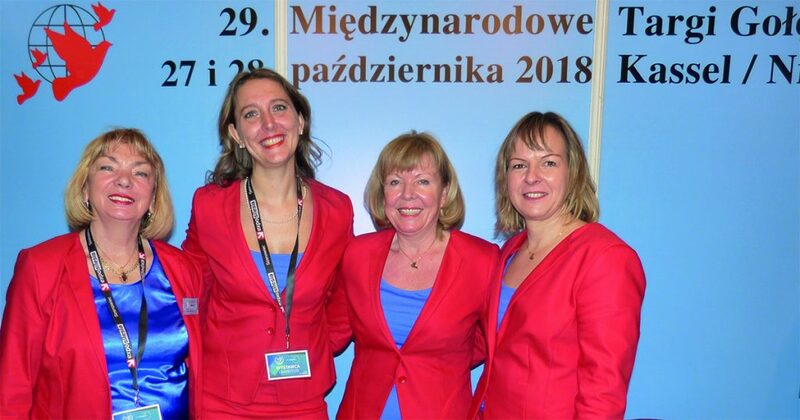 From 12th to 14th of January the Organizing Team of the ITM Kassel was present with an Info-Stand at the EXPOGolebie in Sosnowiec near Katowice/Poland – the most important exhibition for the polish pigeon fanciers. This event is on the one hand an international pigeon fair and on the other hand the national racing pigeon exhibition. As a very nice act of courtesy the organizers of the EXPOGolebie handed over to Irma Kreutzfeldt (the organizer of the ITM Kassel) a wonderful engraved glass cup with thanks for the excellent cooperation during the last 10 years. 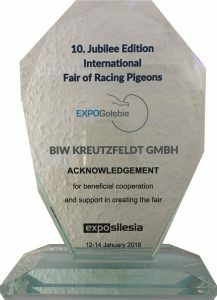 Such an international cooperation between the organizers of racing pigeon exhibitions can only be of advantage for both, pigeon fanciers and exhibitors – this was proved by the increasing number of visitors and sales results in Kassel and Sosnowiec. Organisatoren VJB Houten en Taubenmarkt Kassel slaan handen ineen!